The world has seen many great music artists since the Beatles, but it’s taken over 50 years for someone to match their Billboard World Record. That someone is none other than Ariana Grande, who wasn’t even born when the record was set. The singer’s most recent album Thank U, Next dropped earlier this month, and while its Official Album Chart number 1 placement proves it’s been a hit on the whole, three songs in particular put Ariana level with the Beatles. The Billboard Hot 100 placed the 25-year-old in all of the top three spots, with 7 Rings at No. 1 for the fourth week running, Break Up With Your Girlfriend, I’m Bored debuting at No. 2 and Thank U, Next rebounding from No. 7 back up to No. 3. According to Billboard, the Beatles are the only other artists to successfully monopolise the top three in one week in the Hot 100’s 60-year history, with Can’t Buy Me Love, Twist and Shout and Do You Want to Know a Secret earning them the record. Drake came close to matching the legendary band’s record last year, as Nice for What, Nonstop and God’s Plan placed No. 1, No. 2 and No. 4 respectively, but the No. 3 spot eluded him and he was unsuccessful at matching the Beatles. 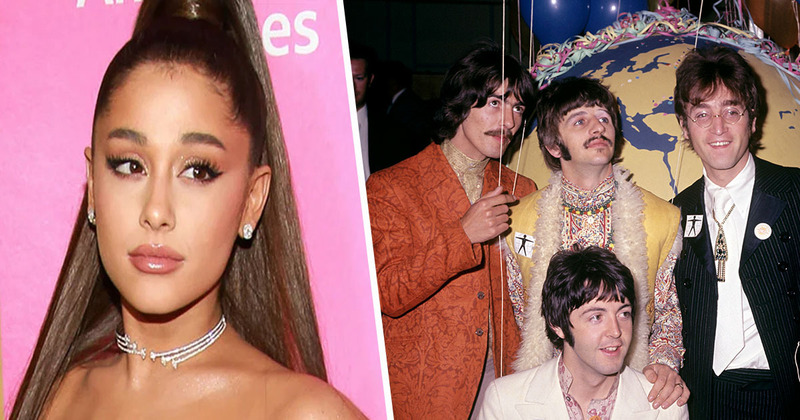 While it’s taken 55 years for someone to meet their record, Ariana still has some way to go before she beats it, as the Beatles held on to the top three spots for an impressive five weeks in 1964, and at one point they even held the entire top five. Still, the No Tears Left To Cry singer will always be the first female artist to achieve the record! Nielson Music reports, via Billboard, in the week ending February 14 7 Rings had 63.5 million U.S. streams, Break Up With Your Girlfriend, I’m Bored totaled 59.2 million, and Thank U, Next earned 36.8 million streams. According to the Official Charts,the singer also broke the record for the most first week streams from an album by a female artist, replacing the previous record which she set herself with her 2018 album Sweetener. She also reportedly became the first female artist to replace herself at No. 1 in the UK singles chart. Thank U, Next has certainly taken the world by storm; we’ll have to wait and see which records the Dangerous Woman singer breaks next.